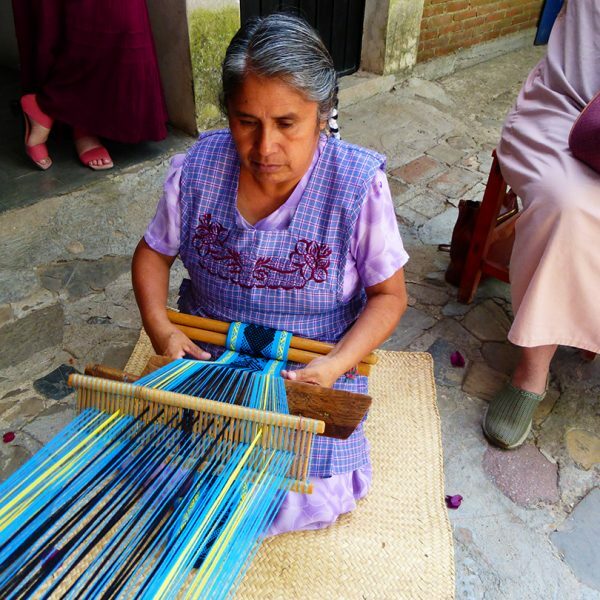 Crispina Navarro Gómez, from the small town of Santo Tomás Jalieza, Ocotlán, Oaxaca, is a highly skilled weaver who still uses the traditional back strap loom called a telar de cintura or telar de otate. 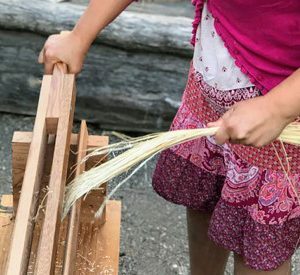 The technique of using a backstrap loom consists of securing an end of the loom to a tree or post and the other end to the waist of the weaver, maintaining the tension with the weight of the body. This is a pre-Hispanic technique that continues to be used without major changes over the centuries. 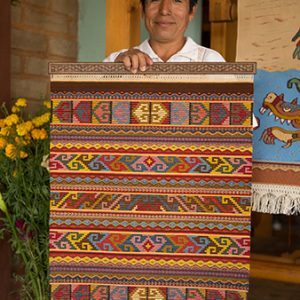 The complexity of the work that can be created on this loom is limited only by the skill of the weaver, and the entire loom with the weaving in progress can be rolled up at any time and carried from place to place.